Professional Judging to take place Saturday with Awards on Sunday. It is the goal of the organizers of the Ocala Pumpkin Run to ensure all individuals enjoy their time while on the grounds of the car show and participating in any sponsored activities for this event. With this in mind, all registered participants, vendors, sponsors, and guests are reminded that they are subject to the following rules and regulations. Failure to abide by these rules may result in removal from the show premises and possible refusal to grant space/entry into any future events. Photos taken by our staff may be used for our promotional materials for future events. We employ photographers at the event to capture many aspects of our activities throughout the entire weekend. It is understood that by participating in any way with this event, that your image may be used by us in our promotional material for the current event and for future events with no compensation to any individual or group. 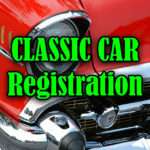 This includes sponsors, vendors, entertainment, participants, and guests. The sale of guns, knives, martial arts weapons, etc is strictly prohibited. The sale of fireworks, ammunition, adult items and drug paraphernalia is explicitly prohibited. 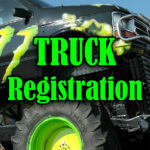 Registered motor home/RV overnight parking is available for $75. Vehicles must be self contained as no hookups are available. The Car Corral spaces are for vehicle sales only. All vehicles in corral must be for sale. Crafts & Antiques Spaces shall be used for sale of such items only and may not be used as camping or parking spaces. 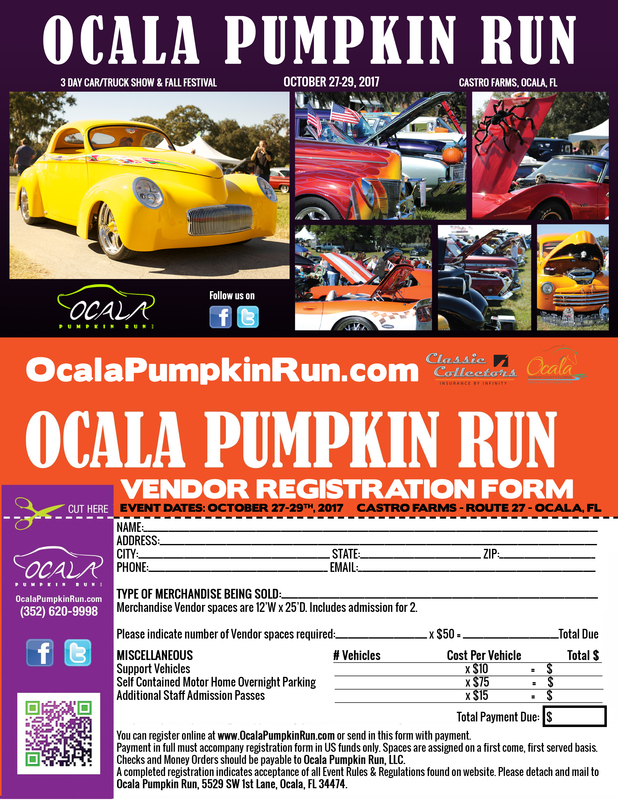 Ocala Pumpkin Run, LLC (OPR) assumes no responsibility for any damage or loss by fire, theft, or any other cause whatsoever. 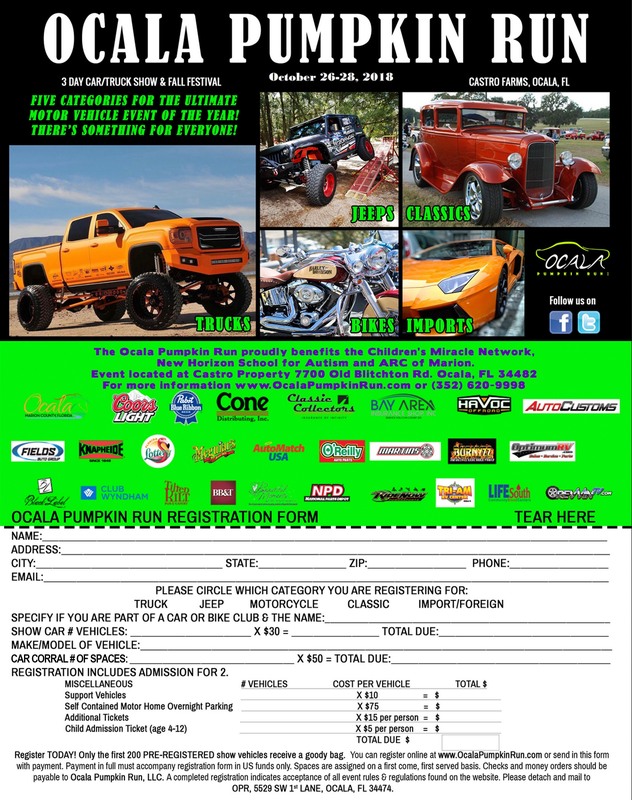 Vendors, Sponsors, participants, and guests use the grounds and facilities at their own risk and agree to indemnify and save harmless OPR, its agents and employees from any loss or liability, including but not limited to, costs of defense resulting from participation at events conducted by OPR and/or held at Castro Farm. Vendors will indemnify and save harmless OPR for any such loss or liability arising from conduct of any vendor towards another vendor or the public. For health and safety reasons, all participants are strongly discouraged from bringing pets. If it is necessary, pets must remain in your registered space or in your RV/motor home. Pets must be leashed and under control at all times. You must clean up after your pet immediately. Any offensive or unsafe actions by your pet will result in immediate removal from the grounds. OPR organizers reserve the right to reject application for space rental or renewal based on unsatisfactory previous conduct, merchandise that does not fit within the scope of the event, or upon any other basis made in the sole determination and sole discretion of OPR. OPR also reserves the right to remove individuals who exhibit unsatisfactory behavior during the event. Security is provided for the venue only. Overnight security is onsite from Wednesday – Sunday. 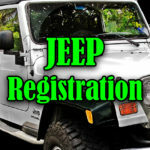 All event participants are responsible for all of their own property, i.e., vehicles, parts, merchandise, etc. Set-up may begin no sooner than Wednesday, October 26th and tear down must be completed by 5pm, Monday, October 30st. No equipment of any kind may remain at the site. 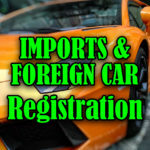 Automotive Midway spaces shall be used for sale of automotive parts, accessories, cars, etc, only and may not be used as camping or parking spaces. 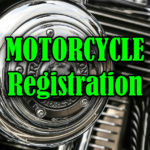 Vendors and guests will not be allowed to use any type of motorized vehicle or bicycle during the show. Three or four wheeled electric convenience vehicles for the disabled are permitted. Discount Mobility is the scooter provider for the event. Please call Daniel for reservations (352) 237-5440(limited quantity available). Vendors will be charged for removal of excessive trash that is not properly bagged. It is mandatory that all cardboard boxes be broken down and stacked. 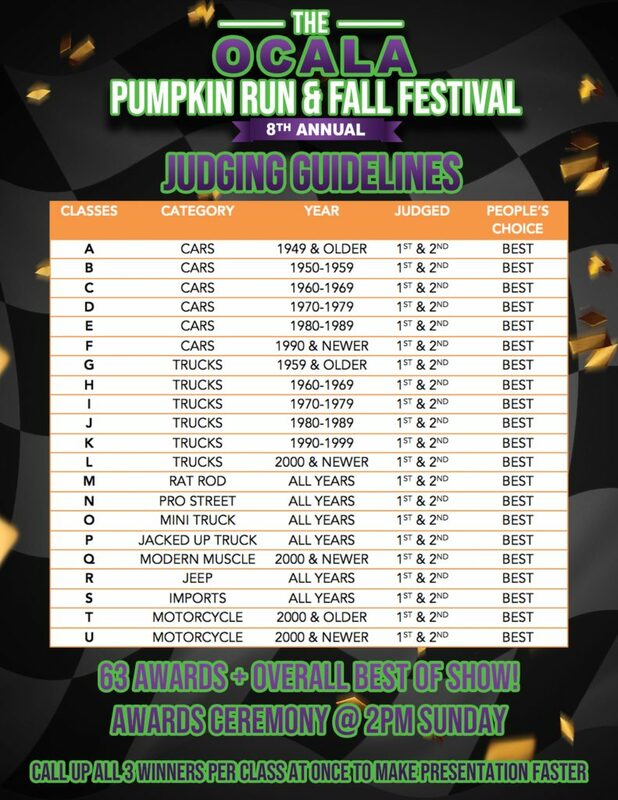 These rules and regulations may be revised and modified by Ocala Pumpkin Run, LLC organizers at any time.